Karen Millen of London and author Vivian Valtas Schmidt unite for a local Chicago charity, Vincent and Annabella's Garden. I knew I could create the life I wanted by setting goals and then following my dreams. Karen Millen knows what it's like to restyle your life. The London-based fashion designer started her business with a loan of one hundred pounds in 1981. Since that time, she has built a global brand synonymous with effortless chic. Now the company is recognizing the achievement of a local author, Vivian Valtas Schmidt, by hosting a book signing of "Stiletto 911: The Makeover Manifesto of a Career Woman", at the store's downtown Chicago location. 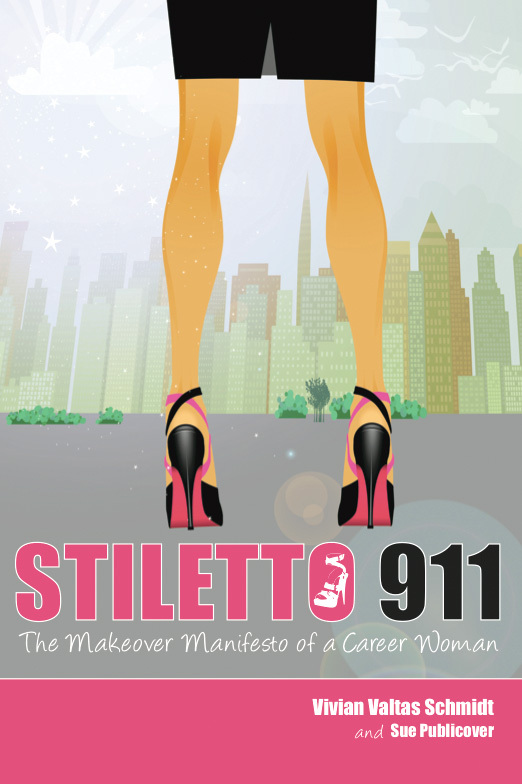 Vivian Valtas Schmidt envisioned that her modern-day fable, "Stiletto 911: The Makeover Manifesto," would motivate women to make positive changes in their lives. An entrepreneur who started her first business enterprise at the age of seven (selling pumpkins), Valtas Schmidt puts her life lessons to work in the book. She has blended that knowledge with the lighthearted story of a young woman of privilege who suddenly finds herself without a fiscal safety net. With the help of a 21st century spirit, she tackles the challenge of restarting her life on her own, a journey that Valtas Schmidt can appreciate. "I grew up without luxuries, but I knew I could create the life I wanted by setting goals and then following my dreams," says Valtas Schmidt, who works with youth and serves on the board of the Valentine Boys and Girls Club of Chicago. A fan of the Karen Millen style, Valtas Schmidt shared her book with Karen Millen's staff in New York and London. The company designs distinctive, glamorous style for today's confident, uncompromising woman-a perfect "fit" for Valtas Schmidt's vision. Gemma Metheringham, Managing and Creative Director for Karen Millen of London said that "every woman who wants to live her life in a spirited, dynamic and individual way should read this book. A thoroughly modern read for today's woman, I know our customers will love it." Karen Millen's boutique at 900 North Michigan will host a book signing to bring its customers together with "Stiletto 911" on Thursday, March 15, from 6 to 8 p.m. In addition to having copies of the book signed by Valtas Schmidt. The event will benefit Vincent & Annabella's Garden, a charity that helps families with children who are battling pediatric illnesses. The foundation was established by Jennifer and Freddie Villacci, who lost their son, Vincent, to cancer at the age of 7, and their daughter, Annabella, to a mitochondrial disorder at 6 months. 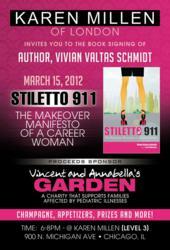 Valtas Schmidt will donate 100 percent of the proceeds from the sale of "Stiletto 911" at the book signing to Vincent & Annabella's Garden. For more information on "Stiletto 911" and the book signing at Karen Millen, contact Vivian Valtas Schmidt at vivianvaltas(at)yahoo(dot)com or call (312) 835-1908 . To learn more about Vincent & Annabella's Garden, go to Karen Millen knows what it's like to restyle your life. The London-based fashion designer started her business with a loan of one hundred pounds in 1981. Since that time, she has built a global brand synonymous with effortless chic. Now the company is recognizing the achievement of a local author, Vivian Valtas Schmidt, by hosting a book signing of "Stiletto 911: The Makeover Manifesto of a Career Woman", at the store's downtown Chicago location.